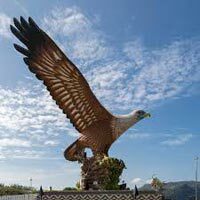 On your arrival in Langkawi Airport meet our representative who takes you to your pre-booked hotel. Check in at the hotel and relax, the day is to be spent at leisure. Langkawi is an archipelago of 104 islands located off the western shore of Malaysia. It is often termed as The Jewel of Kedah. You can spend the rest of the time exploring nearby attractions. Overnight stay in hotel. After breakfast leave for Langkawi Island Tour. Our attraction of the day is Pulau Singa Besar, also known as Big Lion Island. This white-sand haven is surrounded with hillocks and is a perfect spot to behold the sight of eagles flying as near as 6 feet above you. After a well spent day return overnight in the hotel. Spend the day at your leisure. Rest in your luxury hotel room. Soak up the ambiance of the blissful islands on your own. Relax on the beaches. Walk through the peaceful villages. Taste the delicious gastronomy. The charming allures of the island grants cherished memories. Today, after breakfast you check-out from the hotel and proceed for Kuala Lumpur city tour. Starting from Karyaneka (a repository of Malaysian handicrafts, souvenirs, toys, jewelry, books and what not! ), you head to the King’s Palace, passing other great attractions like Golden Triangle Area, Chinatown and Independent Square. Later, Jamek Mosque is to be visited; one of the oldest and most revered mosques of Malaysia. After this, head to National Monument which is dedicated to the brave warriors who sacrificed their lives in the wars. You will also visit Sultan Abdul Samad Building (an epitome of brilliant Moorish architecture dating back to 19th century), National Mosque, National Monument and Kuala Lumpur Railway Station. Overnight stay in the hotel. After breakfast, proceed to Genting Highland, an amusement park located at hill-top. On your way to Genting, stop at Batu caves for about 20 minutes. This is a limestone hill with caves & cave temples and an iconic statue of Lord Murugan. And as you reach Genting Highland you check in at a hotel. Now you have a wide variety of entertainment options to choose from, that too with a soulful backdrop. The tour also includes one-way cable car ride and a Genting Snow World Pass. Stay overnight in the hotel.